This is Esoteric's first official instrumental opus. 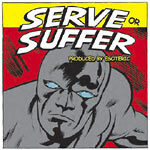 These are NOT beats used on other albums and lazily rounded up for a quick release to exploit fans, but rather all original production that takes the listener through a sound track that could have escaped from the Jack Kirby sketched pages of a silver age comic...hence the title and cover artwork...so once again, sit back, relax, and enjoy as Serve Or Suffer showcases Esoteric as one of the most prolific and revered producers/artists in the genre today. Limited to 1000, so don't wait! Produced by Esoteric, cuts by 7L and DC.